Popular format for reporting miscellaneous payments and non-employee compensation. 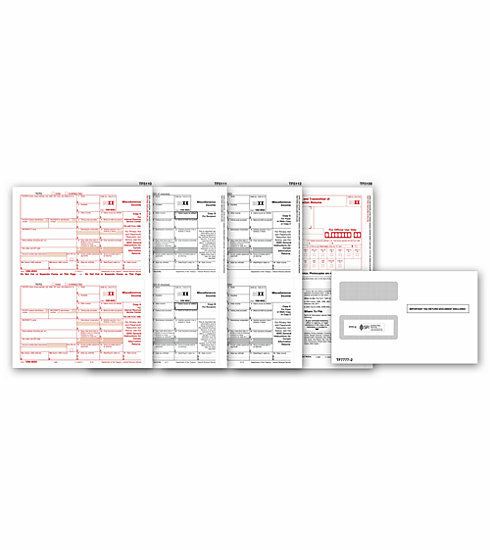 Meets all government and IRS filing requirements.All the laser 1099-MISC tax forms and envelopes you need in 1 package, for 1 low price! State Requirements: Meets 3-part state filing requirements. Amounts to Report: Generally $600 or more (All Amounts or $10 or more in some cases). Use to Report: Miscellaneous payments, such as rents, royalties, medical and health payments and non-employee compensation. Tax Set Includes: Misc. Copy A, Misc. Copy B, Misc. Copy C, Self-Seal Confidential Envelopes, and 1096 Transmittals.